As the latest expansion for Twilight Imperium, Shards of the Throne builds on the epic gameplay experience of galactic conquest by adding new races, new systems, new ways to engage in political intrigue, and much more. With 40 new plastic pieces, 16 new System Tiles, 3 new races, and new rules for Mercenaries, Flagships, Mechanized Units, and Representatives, Shards of the Throne makes the universe infinitely more dangerous, and the glory of conquering it even greater than before! The legacy of a ruined empire silently echoes across the stars, its presence still felt as a timeless entity. It is hope. It is a promise. It corrodes the dreams of a peaceful universe into visions of alluring conquest, propelling the entire galaxy into an endless struggle for power. 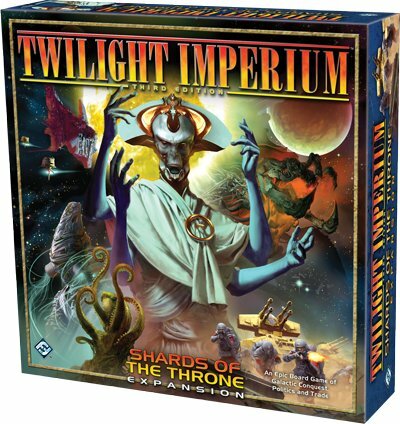 Shards of the Throne is an epic expansion for Twilight Imperium, adding new races, new units, and many new options to create an even more incredible power struggle in the far reaches of the galaxy. Mercenaries, Mechanized Units, and all-new Flagship units give players more options for customizing their fleets and Ground Forces, while the Political Intrigue option will crank up the agendas and espionage of the political phase. Also adding Race-Specific Technologies, alternate Strategy Cards, new System Tiles, Space Domains, and an all-new scenario that puts one player in control of the legendary Lazax Empire, Shards of the Throne creates a completely new way to wage your galactic conquests!